Sometimes we need a reminder of better days. A time when if you wrote a letter to the president and received a response, it would be eloquent, empathetic and supportive. Back in October 2012, before the Supreme Court made marriage equality the law of the land, a little girl named Sophia Bailey-Klugh was being bullied. Sophia's classmates teased her because she had two dads in a loving relationship. It was difficult for the child to bear. So she wrote a letter to her "hero" President Barack Obama. It's Sophia Bailey Klugh. Your friend who invited you to dinner. You don't remember okay that's fine. But I just wanted to tell you that I am so glad you agree that two men can love each other because I have two dads and they love each other. But at school kids think that it's gross and weird but it really hurts my heart and feelings. So I come to you because you are my hero. If you were me and you had two dads that loved each other, and kids at school teased you about it, what would you do? P.S. Please tell your daughters Hi for me!" It's a heartbreaking letter, and not the kind of thing a child should ever go through. 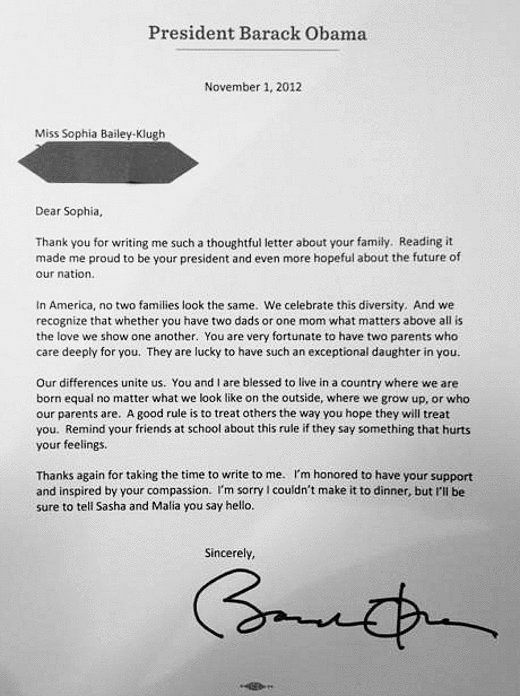 President Obama, ever the picture of class, responded to the letter, empathy evident in his reply. Thanks again for taking the time to write to me. I'm honored to have your support and inspired by your compassion. I'm sorry I couldn't make it to dinner, but I'll be sure to tell Sasha and Malia you say hello. All these years later and this letter is still a perfect representation of the former president's class and compassion. It gets shared every few years when we need it. The fathers of the girl have shared it themselves. We really miss having him as our president. Sometimes it only takes a few minutes to send a few words of support and kindness to a child with a broken heart. The fact President Obama had that capacity while still running the country is commendable.